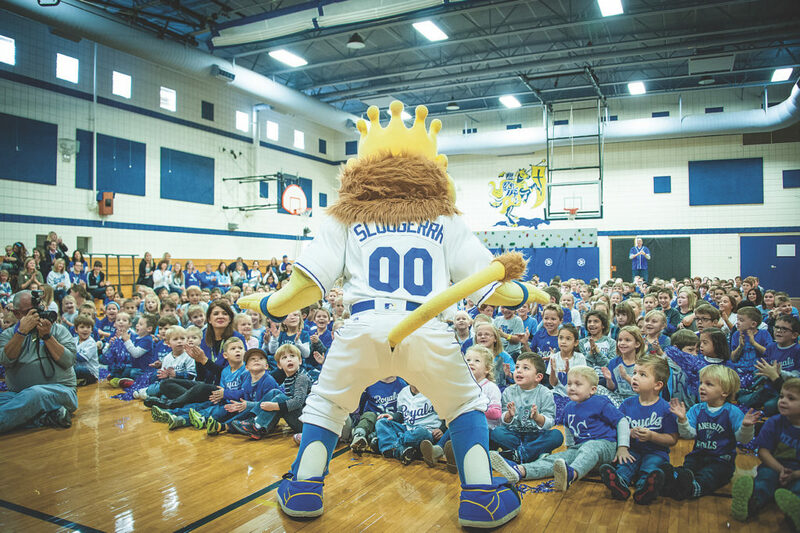 LEAWOOD — Students at Church of the Nativity School here were decked in royal blue as they were welcomed into the school gymnasium by former Kansas City Royals players Dec. 6. The Royals alumni surprised the students with their appearance, but they weren’t the only special guests in the building that day. Sluggerrr, the team’s mascot, also showed up to help the alumni present a gift to Variety Children’s Charity, which provides children who have developmental disabilities with the adaptive equipment and opportunities they need to be included. Nativity is one school that uses the charity’s equipment to ensure all of its students have the chance to participate in school activities, regardless of any disability. Together, Royals Charities and the team’s alumni donated $65,000 to Variety, which will use the gift to build an inclusive playground at Leawood City Park. For more information on Variety, visit its website.